One of the ways to tell the future of any city or neighborhood is to find out if investors are willing to put up their money to underwrite new ventures. By that criterion, New Orleans’ Warehouse District is on a roll. There is, for example, the new Rouses Supermarket in the 700 block of Baronne Street. A multi-million dollar investment by the Rouse family of Thibodeaux, the store – designed by John Williams, a New Orleans architect with offices in the Warehouse District – is a beauty, frequently filled with shoppers who live, work or pass through the Central Business District. On one recent afternoon, Danae bought a delicious-looking apple pie while I was drawn to the sushi prepared by an attentive Rouse’s chef behind the counter. Like the very successful Whole Foods on Magazine Street, the new Rouses is changing the way that residents and workers in the Warehouse District shop for food and eat. It was a huge gamble by the Rouse family. No one has opened a food store in the Warehouse District in more than 50 years. Give credit to Danny Rouse, president of the Rouses outfit, and his advisors. Equally important, the new store – built on the site of the former Sewell Cadillac – has created more than 200 new full-time jobs with benefits. But it isn’t just the Rouse family that is feeling good about the Warehouse District. Developer Brian Gibbs has sunk $85 million into new modern apartment and condominium buildings, most of which are filled. 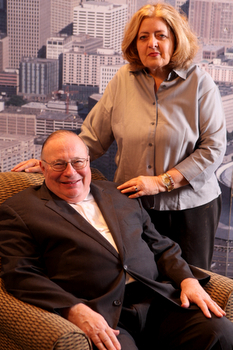 The Pritzker family has decided to make a bet on New Orleans, wagering $243 million on the rebuilt Hyatt Hotel. Tom Benson and his family are investing $100 million into the remake of the Benson Tower and an attached office-sports complex. What does all this have to do with readers of UptownMessenger.com? The fact is that New Orleans, since Hurricane Katrina, is in the midst of a remarkable comeback. You can see it in the residential neighborhoods of Uptown and Broadmoor, in the success of Magazine Street and the emergence of new food and entertainment districts on Freret Street and Oak Street. If the resurgence of the Warehouse District proves to be lasting, it will broaden and strengthen the New Orleans comeback, in turn making the city a more cohesive and affluent place to live. Qualifying begins | District B Councilmember Stacy Head and former Bill Jefferson campaign manager Eugene Green both qualified Wednesday for the Council-At-Large seat vacated by Arnie Fielkow. Qualifying also began for the Orleans Parish Democrat and Republican Executive Committees and the State Democrat and Republican Central Committees. Qualifying ends Friday at 5 p.m. Surprise decision | Many readers were probably surprised by Federal District Court Judge Jay Zainey’s ruling this week rescinding Tuesday’s eviction of the protestors in Duncan Plaza. Though we are firm believers in the First Amendment, we thought that Mayor Landrieu made the right decision to ask the occupiers to move on because of health and safety issues. We’ll be watching this week’s developments closely and we bet you will be too. Allan Katz spent 25 years as a political reporter and columnist at The Times-Picayune, and is now editor of the Kenner Star and host of several televsion programs, including the Louisiana Newsmaker on Cox Cable. Danae Columbus is executive producer of Louisiana Newsmaker, and has had a 30-year career in public relations, including stints at City Hall and the Dock Board.